Image: Left: Picture of a birdcage MRI coil with the metamaterial on the right side of a spherical phantom. Right: Far field scattering patterns at the two Kerker scattering conditions: backward (top) and forward (bottom) directivity enhancement. Ultrahigh-field (UHF) magnetic resonance imaging (MRI) systems are getting a lot of attention as they ensure high intrinsic signal-to-noise ratio resulting in higher spatial and temporal resolutions as well as better contrast. This promises improved clinical results with regard to morphological as well as functional and metabolic capabilities. Traditionally, MRI relies on volume coils (birdcage) able to deliver a homogeneous radio frequency field exciting the nuclei magnetic spin. However, this strategy is hindered at UHF because of the rf field inhomogeneities yielded by the increased Larmor frequency. A standard approach consists of inserting passive dielectric elements within the volume coil in order to locally enhance the rf field and mitigate these inhomogeneities. However, the lack of control over their electromagnetic properties prevents the development of optimal solutions. 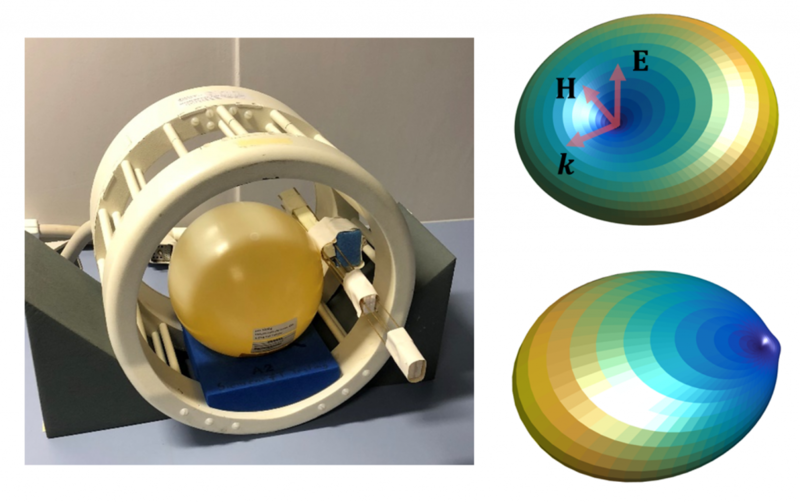 Here, a single meta-atom is used to achieve efficient and tunable rf field control in UHF MRI. We demonstrate theoretically and experimentally a full overlap between the electric dipolar and magnetic dipolar resonances of the meta-atom. This interaction is precisely tuned to reach the so-called Kerker scattering conditions when illuminated in the near field by a birdcage coil. At these conditions, a strong enhancement or suppression of the rf field is achieved in the vicinity of the meta-atom within the MRI volume coil.